CRCS will be moving in several new directions this year, which we think will be of interest to a wider audience than just those of us interested in financing clean energy. We’ve been focusing more on communities in the past year, and on the values and vision that led to our mission, to assist local communities and neighborhoods to become more resilient in the face of the widening impacts of a changing climate. We are proposing to work with one or two towns in New Jersey on their revitalization and self-renewal. Culture actually holds the key to greater local resilience, alongside the physical transformation of communities into eco-communities. And organization is what’s needed to transform culture. We are planning to create “civic cooperatives” that will lead these communities into a positive self-generating future. Many communities are today experiencing decline, or struggling to ignite a self-renewal, within the broader context of the need for a world for a world that shifts carbon from the atmosphere back into the soil. The cooperative model has proven itself to be more enduring, more beneficial, and often more valuable to communities than the conventional marketplace business model. What makes this possible is that we have a number of tools with which we can assist groups in organizing their communities with more sustainable development. To begin with, we have the clean energy financing tools mentioned earlier, one of which — DREAM financing — is in principal able to be utilized today, though it has not yet been tried or tested. PACE is hopefully on track for approval in New Jersey in the first half of this year. Together, these innovations fulfill our goal of bringing financial resources to communities and groups to enable transformational change. We also apply regenerative design and permaculture principles to community redevelopment, and act as catalysts for more rapid evolution. 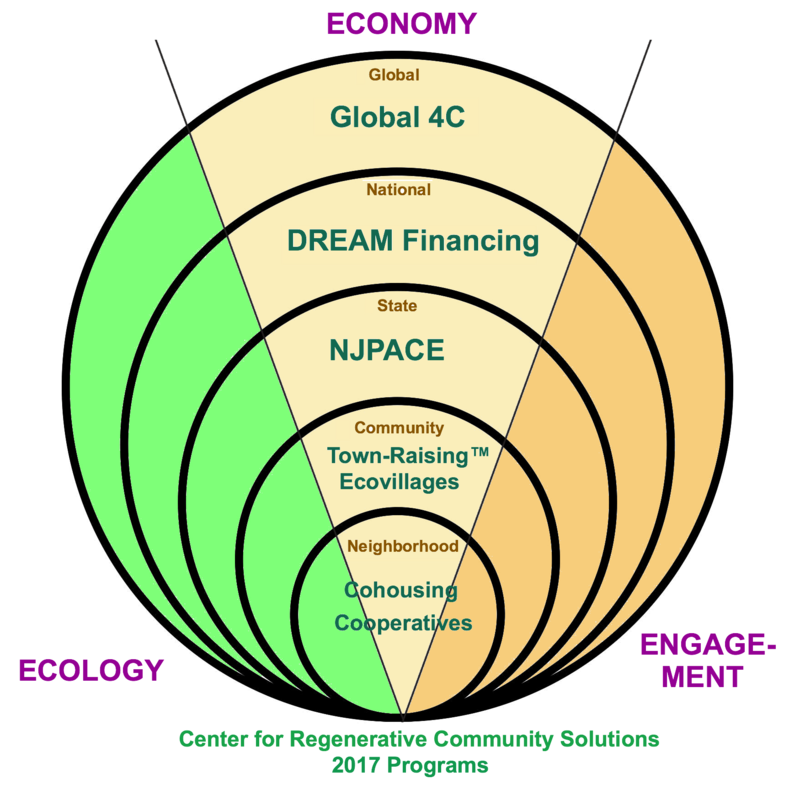 Together with other organizations and professionals we are able to bring inspired planning and action, whether it is to the creation of an ecovillage or cohousing community or of cooperative enterprises in food, energy, the arts, and finance. Here’s an overview diagram showing our current programs, from local to global. At the planetary level, we are supporting Global4C, an international monetary policy proposal for carbon risk mitigation. 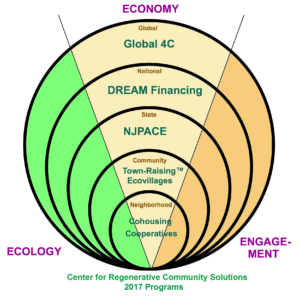 At the community level, we invite you to learn about and join our major sponsored programs, Ecovillage New Jersey and the new Ecovillagers Alliance. And at the neighborhood level, we’re looking to build Regenerative Cohousing and local cooperatives for clean energy, local food, and local economic development. If you are ready to collaborate with us on meaningful work, we invite you to join one of our cooperatives-in-development programs, and get involved in restoring ecosystems and remaking communities. Stay tuned for more information. 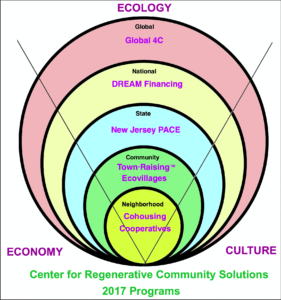 This entry was posted in Climate Change, Cohousing, Community, CRCS, Energy, New Jersey, News, Nonprofit Activities, Regenerative Development, Sustainability. Bookmark the permalink. 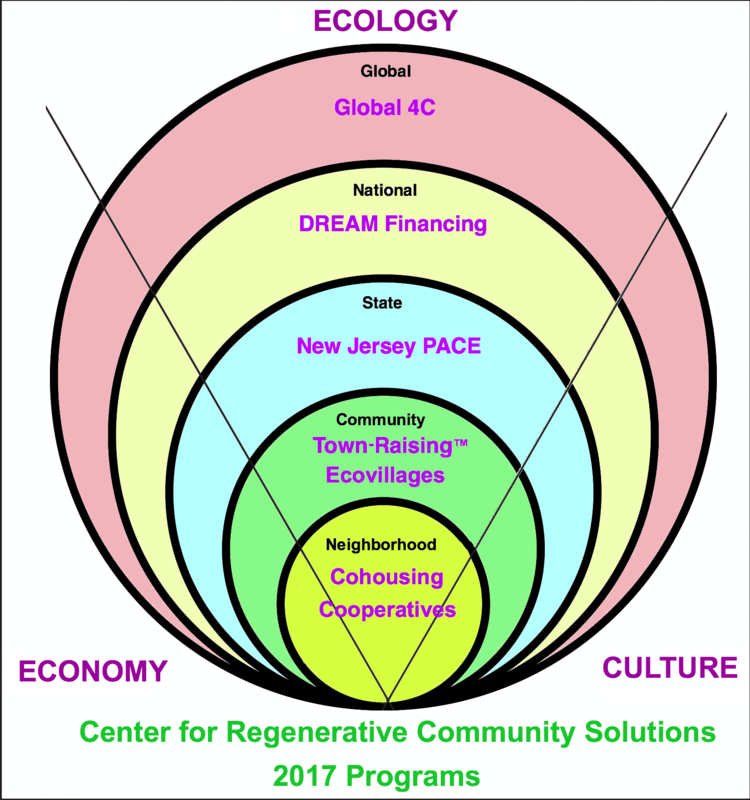 I live in Jersey City and I would love to be involved with Pace NJ with the goal to develop and spread the knowledge and importance of renewable resources in this our state. Contact my email address.